First Presbyterian Church of Ann Arbor typically offers three services at 8:00 a.m., 9:30 a.m., 11:00 a.m. and offers Family Sundays approximately once a month when children are encouraged to worship with their families. In the fall, the 9:30 and 11:00 a.m. services are typically held in the Sanctuary, with the 8:00 a.m. service is in a more intimate setting, Monteith Hall. 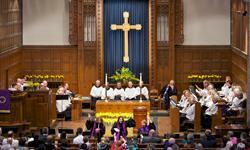 Our services include music, preaching, readings of Scripture, and prayer. In the summer, the 9:30 a.m. worship service is typcially held outside, weather permitting. Visit our "Sunday Services" page for more information on service times and dates, including any upcoming special or holiday services. Communion is celebrated weekly at the 8:00 a.m. service, and approximately once a month, usually the first Sunday of the month, at the 9:30 and 11:00 a.m. services. 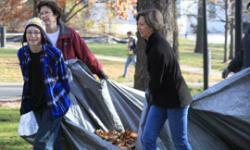 On those first Sundays, we invite all to bring nonperishable food items to share with those in need in our community. The food is collected in baskets as you enter, or brought down on the final hymn of each worship service. Each month, food is donated to a local food bank. Radio Worship is broadcast at 11:00 a.m. on WAAM (1600 AM) and on the web (www.waamradio.com/). Free podcasts (audio) and printed copies of sermons by our pastors are also available. Visit our "Sermons" page to view or listen to a sermon. Worship bulletins are available from the ushers during service times. Feel free to take them home with you. Large print bulletins, Bibles, and hearing assistance devices are also available from the ushers. Previous bulletins may also be found on our "Bulletins" page. 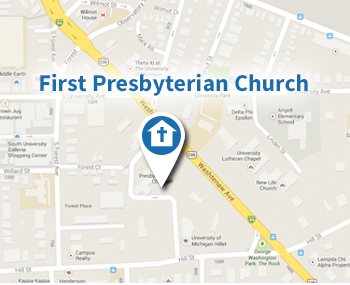 Permanent First Presbyterian Church name tags are available for $9. Order a name tag here.